Robotiq's Insights program analyzes productivity data and sends alerts when a cobot stops. In the latter scenario, the cobot's situation can be checked quickly and most likely it can return to the production line, thus minimizing production time and financial losses. 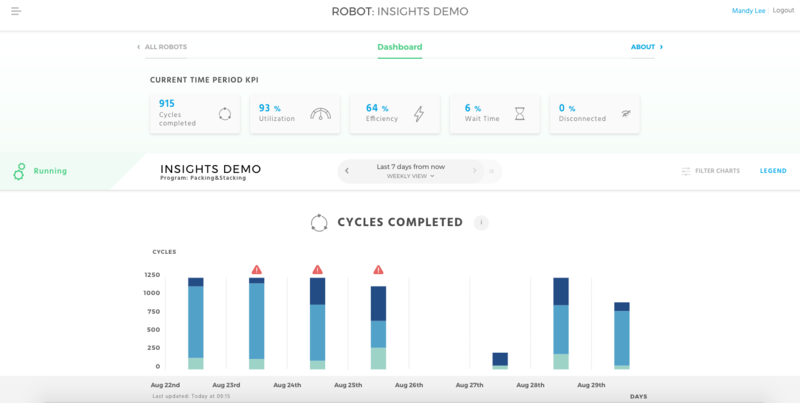 "We have many customers using Insights and they're appreciating the immediacy of the remote alerts rather than the old method of waiting til a human walks by the cobot and notices it is not functioning. It's been an easy decision for companies to invest in this," explains Rock Howe, President of The Knotts Company. Insights software gives manufacturing engineers the right KPIs to improve their product quality and increase process efficiency. Automation engineers get the data to optimize robot performance by reducing cycle time and diagnosing failures. Production managers see the long term trend in robot performance to improve planning and overall productivity. Insights Dashboard (see image below) also gives the operators real-time status and alerts to simplify the production. Insights is compatible with Universal Robots as well as their new eSeries. To develop a plan to bring Robotiq's Insights to your company, contact us at 908-464-4800 or solutions@knottsco.com.